A new food village will satisfy sheep enthusiasts, families and food lovers. Galway 2020’s Project Baa Baa will present the first of its events as a part of Sheep 2018 Farm to Fork in Athenry this weekend. Celebrating Europe’s sheep and sheep farming culture, Project Baa Baa highlights the cultural, economic and environmental contribution of sheep farming in Ireland and across Europe. Teagasc's Sheep 2018 Farm to Fork takes place on Saturday, celebrating the sheep themes of craft, food and agritourism. The themes will be represented by a range of wool crafts, new eco products, sheep cheeses and meats, as well as farm-based businesses, including a farm shop. Demonstrations will include sheep shearing, dog sheep trails, lamb breeds and cheese maturing, benefits of wool, spinning wheel making, spinning, Aran knitting, crochet, felting and dyeing wool. A new addition this year is a food village to celebrate Galway European Region of Gastronomy 2018. The free event takes place from 10am to 5pm, and will feature cooking demonstrations by Catherine Fulvio, a local food showcase and circus acts. There will be an opportunity to sample more than 30 varieties of sheep cheeses, in addition to cured meats. Irish cheese will be presented by Cáis na Tíre, Rockfield Velvet Cloud, Cratloe Hills and Cashel Blue. Maturing European Cheeses from Ireland, England, Italy, Spain, Portugal, France and Corsica will be on display by Sheridan’s, Galway. McGeough’s Meats - Connemara Fine Foods will present on curing and smoking meats, while Farmer Sharp and Achill Mountain Lamb will also be doing demonstrations. Programme Coordinator for Galway European Region of Gastronomy , Elaine Donohue, says it is an opportunity for Galwegians to learn more about the food industry. "We are very excited to have such a unique showcase taking place in Athenry. Our theme for the year is ‘From the ground up,feeding our future’, so we are encouraging people to get out and learn more about our food industry," she says. "It is important not to miss these opportunities to learn and engage at primary level so come alongto S?heep2018? for a family-friendly experience.”? Catherine Fulvio will present two one-hour demonstrations on cooking lamb at 12 noon and 2pm, while lamb butchery demonstrations will also take place at 11am and 3pm. The Irish Guild of Weavers, Spinners & Dyers will demonstrate the spinning raw wool after shearing, wool washing, sorting, blending, dyeing and weaving, as well as different finishing methods. There will also be a demonstration from IGWSD’s Grace O’Neill, also known as ‘Babbles Travelling Yarn’ blogger. Eddie Doherty, a well-known hand weaver based in Ardara, County Donegal, will demonstrate hand weaving on his own loom. Eddie produces a wide range of traditional handcrafted products from tweed using 100 per cent Irish wool. 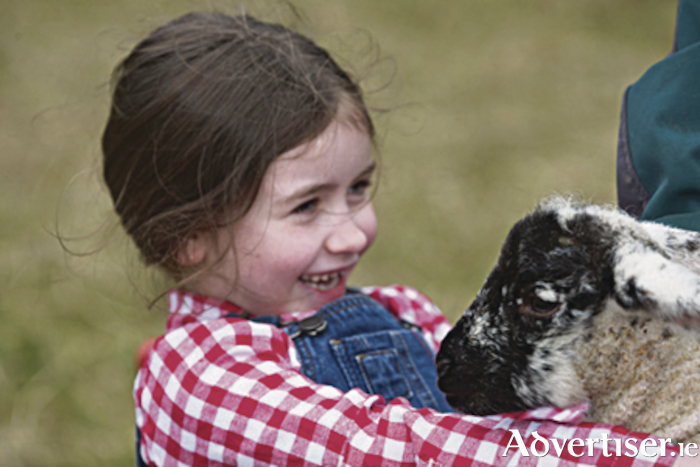 Sheep shearing, meat cutting and sheepdog training demos will also make up a part of the event. With education being a large aspect of the project, the event will host a ‘Kids Space’ centred on interactive wool and sheep-based activities for families and children. A fun element for the day is the launch of the Primary Schools Sheep Project and the Project Baa Baa and Teagasc colouring competition. Children can draw on a sheep mural or try a colouring competition with parents or map their location in Ireland to Galway on the Wool Map puzzle. There will be a sheep facts area, with information on animal life cycle, wool and fleece, meat, cheese and milk, nutrition and environment. The Minister for the Diaspora and International Development, Ciaran Cannon, says in addition to being another opportunity to showcase Galway`s cuisine, the event will also open further discussion on ways of maximising the potential in the sheep industry. “Following on from the highly successful Bia Food Lovers Festival a few weeks ago, it is very encouraging to see Athenry again the location of a major event focusing on Ireland`s food industry. “The presence of a Food Village will celebrate Galway`s designation as European Region of Gastronomy and I`m delighted to see a contribution of two of East Galway`s Heritage organisations – Abbey Heritage, Loughrea and the Irish Workhouse Centre in Portumna. The aim of Project Baa Baa is to develop a lasting legacy and to encourage the maintenance and development of sheep-related businesses throughout Europe. In the lead up to and throughout 2020, Project Baa Baa, which is led by Seamus Sheridan, Deborah Evers and Emilia Furey, will be hosting a major sheep congress, as well as events, exhibitions, banquets and films as part of the overall programme for 2020. Page generated in 0.2118 seconds.